Frequently asked questions - DEVON YURTS Glamping in Style! Stove lighting equipment, matches, fire lighters, charcoal for firepit if required for cooking. Torches for midnight trips to the loo! We ask that you plan your journey so you can arrive between 4 and 5pm. We do not accept arrivals after 8pm or after dark out of respect to other guests. Do we need to bring a camping kettle? Our fully equipped shared kitchen dining room has a supply of crockery, cutlery, cooking utensils and implements allocated for each yurt, including camping kettles and portable camping stoves. Is there any mobile phone signal at the yurt camp? There is a good signal for 02 users, Orange EE and T Mobile and Vodaphone are patchy. 4G is available. Our yurt camp is off gird so has no electricity to power a router - solar power is not suitable to do this. However 4G has arrived at Hemsford, but the signal can be patchy but you can usually surf the web and connect to the internet whilst sitting on a unicorn!!! We consider our holidays to be the perfect "digital detox". There is also free wifi at all the local pubs! Are we allowed to have a camp fire? Yes we allow a camp fire as long as it is small and managed and contained within the fire pits provided. Fire pits must remain in their allocated location. We supply a small quantity of dry logs if you are booked in the larger yurts. More logs can be purchased on site or are available at local supermarkets/garages. Can we use a disposable barbecue outside at the camp site? Yes you can - we do not supply a barbecue but invite you to bring a disposable for your own use. We would ask you to make sure you do not under any circumstances use one inside the yurt, we would also ask you to keep camp fires within the fire pits provided and to keep all fires small and manageable. Please ensure that disposable barbecues are properly doused after use and are not placed inside the rubbish bins at the camp. Are there charging facilities for mobile phones? 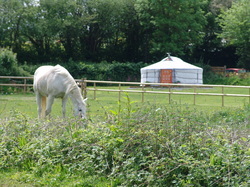 There is one solar charging point in each yurt for mobile phones and other charging points in the communal area. The nearest shops are located nearby at Broadhempston (about 1.5 miles), Bens Farm Shop (about 2 miles), Coop at Ipplepen (about 2.5 miles), Morrisons at Totnes (about 3 miles) and Totnes is ideal for supermarkets,banks and larger shops. However we can arrange for a welcome pack of groceries or breakfast hamper to be provided for you - please advise at time of booking if you will require this. Can we have a one night stay? Yes it is possible to stay for only one night subject to availability however this is only during week days from Sunday - Thursday. There is a single night supplement of £25 per yurt for this. Can we pay using our credit or debit card? We are now able to accept card payments (apart from American Express) however our preferred method of payment is by Bank transfer. We are happy to recommend our local public houses: The Tally Ho Inn at Littlehempston, The Pig and Whistle at Littlehempston, The Coppa Dolla and The Monks Retreat at Broadhempston. There are many fantastic places to eat a little further afield at the Riverford Farm Field Kitchen, The Bickley Mill Inn at Stoneycombe, The Seven Stars Hotel in Totnes, The White Hart at Dartington Hall. There are many more but these are just a small selection of our favourites. Are we allowed to bring our dog? Sorry we cannot permit dogs at the yurt camp - even the most well behaved pets have the potential to worry our livestock. We can however recommend local kennels where you can board your pets. Where can we buy our own yurt?